Dense, natural protection for your horse. Choose this girth if you want to distribute girth pressure over a wide area, soften girth contact on skin and need a highly absorbent lining that will wick away moisture. This is a wide web girth with strong, durable elastic at each end. Stainless steel roller buckles on both ends allow easy tightening and decrease wear on the billets. Two stainless steel center dees are standard. Toklat Woolback pile lining generously covers all portions that will contact the horse. Toklat Woolback fleece is specifically designed to stand up to the rigors of long hours of riding. This extra dense, machine washable wool pile fabric provides the ultimate protection for your horse's skin. Wool is a great natural fiber for the horse. No other fiber combines comfort and durability like wool. It will absorb up to 80% of it's own weight in moisture. It is porous and permits circulation of air and moisture. 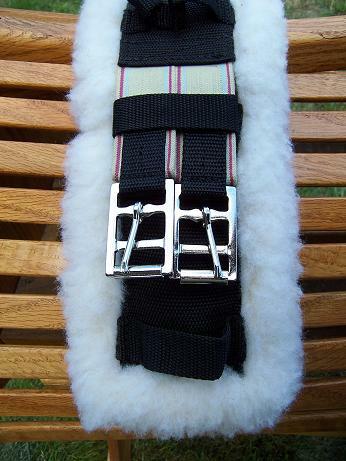 The cuticles on each strand of wool fiber grips better than synthetic fiber, helping to prevent slippage while riding. It is naturally resiliant and long lasting. It resists dirt penetration better than cotton or synthetic fleece. Care and cleaning is relatively easy. The girth may be washed on a gentle machine cycle and laid flat or hung to dry. The fleece can be fluffed with a pin brush.